ESA invites you to return to Växjö, Sweden for our first winter event! Taking place from 17 Feb to 25 Feb entirely within the Royal Corner, this will be a small event with a ‘second stream’ / old ESA feel. For the past 3 years we’ve hosted a 2-3 day marathon at each Dreamhack and have realized that it’s just as much work as running an event ourselves. We feel Dreamhack just wasn’t long enough to present our best work and the loud halls of Dreamhack don’t provide a pleasant venue to practice, speedrun, or hang out. 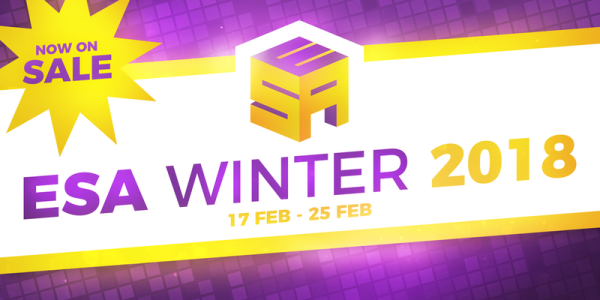 After the success of “ESA Winter Highlights” at Dreamhack Winter 2016 we believe it’s time to run a fully independent winter event. We want the schedule at ESA Winter to be as diverse and varied as the ESA second stream this year, and to carry a similar positive vibe. If you’ve ever considered that you want to do a marathon run but have never attended a marathon before, we think this is going to be the ideal place. We will try our hardest to make sure everyone submitting has at least one game in the marathon. Like old times! There are going to be no limits to tickets even if you are not running. In the event the first hotel allocation sells out we will explore further options, like during ESA. Hotel check in will be available from 4pm Friday 16th, and the event space will open later on Saturday 17th when ready. Anyone who wants to help setup and tear down the practice rooms will need to arrive on Saturday and in return we can offer a [200SEK] ticket. Hotel check out will be on Sunday 25th or Monday 26th at 10am and we hope to have completed teardown by Sunday night. There is no need to stay the full duration, but no discounts are available for short trips. The game selection and schedule group will this year be lead by Fatzke in cooperation with eTholon and IrregularJinny. For full details see the submissions forum post. Attendees who are selected to help on tech, hosting or setup, and who are willing to volunteer 16 hours to their task, will be offered a half price [200SEK] ticket. For tech/hosting this is 4x4h shifts, for setup this is making yourself throughout all of the setup/teardown times. Accommodation is in the hotel itself, and you can book single, twin, triple and quad rooms. The price list is attached below. There will be no mass housing available at ESA Winter. To reserve a, contact the hotel directly. The reservation code is “ESAW”. ESA Winter will be once again fundraising for Save the Children. Please consider in your submissions any incentives that you would find acceptable for your event! The normal price ticket for attendees will be 400SEK. This will be used to pay the conference space for the week. Volunteers will be offered a discount (see above). If you’re intending to volunteer, please wait until the end of volunteer registration before buying a ticket and we will send you a special discount code. If you apply you are guaranteed a ticket no matter what. During the booking process you will be offered the chance to buy the signature (grey) hoodie, a new lightweight (purple) hoodie and an event tee. Zephyyrr and Fatzke like this.